The new Nissan LEAF has been redesigned for 2018, with the new Nissan “V-Motion” corporate identity cut into its nose, and the boomerang-shaped lights to the rear, giving a sleek profile and sharp, dynamic look. The aerodynamics have been improved to lower the drag coefficient from 0.29 to 0.28, with a new lower stance which reduces lift and gives better stability at high speeds. It also increases efficiency, allowing drivers to travel further on a single charge. Nissan Intelligent Mobility is transforming the relationship you have with your car. Imagine a vehicle that can use just one pedal to speed up, slow down and stop, parks on its own and helps warn you against risks coming up around you. With a range of Nissan Intelligent Mobility features, the new Nissan LEAF turns your normal drive into an amazing one. 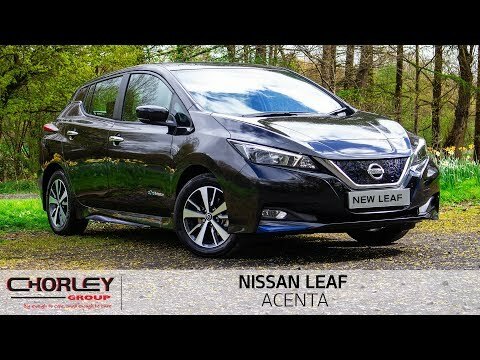 With four cameras giving you a virtual 360˚ bird’s-eye view of your New Nissan LEAF, plus selectable split-screen close-ups of the front, rear and kerbside, tight manoeuvres are a cinch. And if there are any moving objects close by, you'll get a warning on screen too​. No more guesswork! Stay within the speed limit thanks to your smart Traffic Sign Recognition system. It detects road signs and displays the speed limit on the New Nissan LEAF's digital info display as you go. Change lanes with confidence. Blind Spot Warning keeps an eye on the blind spot area and warns you if it detects a vehicle hiding there​. Want to know what's coming up behind? Sensors around the rear of your New Nissan LEAF detect vehicles approaching from either side and give you a heads-up. For confident handling around corners, Intelligent Trace Control reads the situation and, if needed, can brake each wheel individually to help you turn smoothly.